Leon is peerless as a festival caterer, and has been top of our list since we first encoutered him at WOMAD in 1991. Every time I sit down to eat a meal from Leon’s, someone will come up and ask for directions to the stall where I bought it. A former Maths teacher, Leon is nearly always on the stall in person, earnestly explaining each of the dishes. At Leon’s you get a substantial meal of gourmet veggie food, made from high-quality ingredients and prepared with skill and attention to detail. His signature dish is the Leonese Plateful, a meze platter of tasty Lebanese delicacies. The only concessions to outside catering on this stall are the disposable plates and cutlery, but never the food. Actually Leon has been known to go one step further towards the environmental goal and serve the food on edible (potato) plates. Leon has tried a few sites at Glastonbury, but seems to have settled on the north side of the Jazz-World field, echoing his position to the side of the open-air stage at WOMAD Rivermead. Apparently he also has a devout following at Cropredy. Queen Delilah serves excellent and good-value salads. They have tasty black-eye bean burgers too, but the salads are so good they make a nice lunch on their own. Queen Delilah is a regular at Glastonbury on the east side of main route which divides the Avalon and Greenpeace fields, next door to the Manic Organic. I don’t know anything about them, but they have nice friendly women serving up the food. The Manics are a festival institution. A scarily large-scale organisation, a cast of what seems to be hundreds of well-drilled Antipodeans work in and behind their bedouin-style tent, and can process a queue like a military operation. The food is consistently good, a hearty plateful of Vegetable Daal or Chana and Potato Curry being just the thing on a cool evening. Just as you thought festival pizza was always going to be unpleasant greasy stuff best ignored, along comes the Pizza Tabun. Not a stall to visit in a hurry, because each pizza is rolled from fresh dough, topped to your specification and cooked to order in their special pizza oven. But the tent is a charming place to wait, with its comfy cushions and low tables. Unlike the previous entries, this one is also loved by the junior festival-goers, both for the pizza and the chocolate brownies. And the proprietor is a lovely man, whose manners belie his Steven Berkoff lookalike appearance. 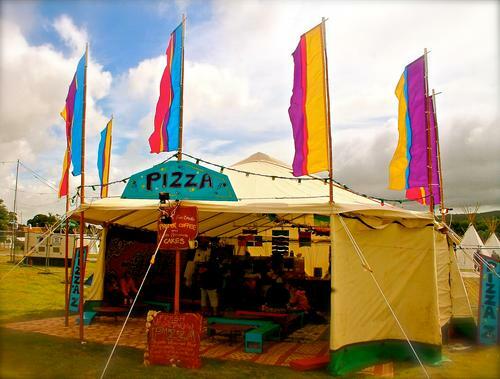 We first tried Pizza Tabun at the Larmer Tree festival. We’ve also found them at Glastonbury (in the Avalon field just round the corner from the Tiny Tea Tent), Beautiful Days, and the Big Green Gathering. The Yeo Valley stall sells the same stuff you can buy in your local supermarket; delicious organic yoghurts from a Somerset dairy farm. 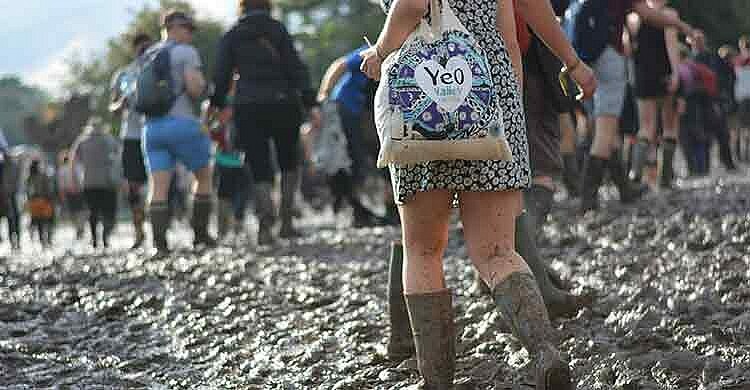 But while most producers hike up the price for the captive audience, Yeo Valley sell big pots of yoghurt at a discount price of £1, which makes them one of Glastonbury’s best bargains. They do frozen yoghurt too. The stall is down in Babylon in the F market area; you’ll pass it as you walk between the Pyramid and the Other Stage.